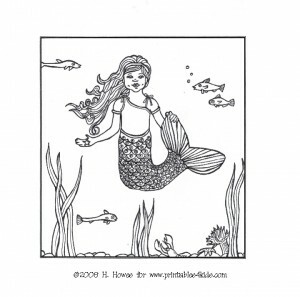 Let your child’s imagination go under the sea with our original mermaid coloring page. Click on image to view and print full size. This would be the perfect companion for a Little Mermaid birthday party. One idea is to print the mermaid coloring page and have the guests color them. Then glue the page onto a piece of construction paper. Add sparkles, stickers and confetti then laminate the activity to make a cute placemat that guest can take with them.